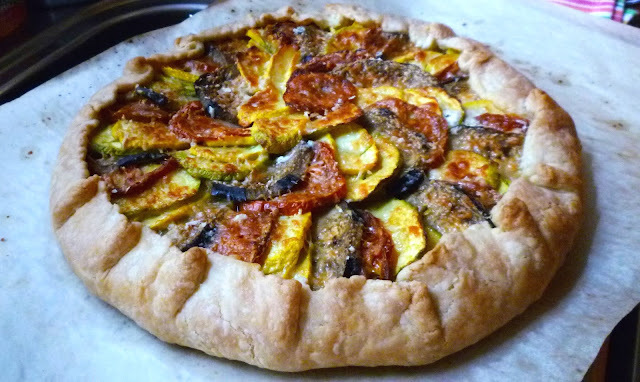 For years I have been making a free form summer vegetable galette that is filled with ingredients that I associate with the South of France: eggplant, zucchini, tomatoes and goat cheese. Because I love this combination of flavors so much, I have continued to make this tart even though it always seemed to be just a tad bit dry. The reason for the lack of moisture was obvious to me: the vegetables were cooked before putting them in the unbaked crust to prevent them from releasing all of their juices into the crust as it baked. A soggy crust seemed even less satisfactory to me than a slightly dry tart. 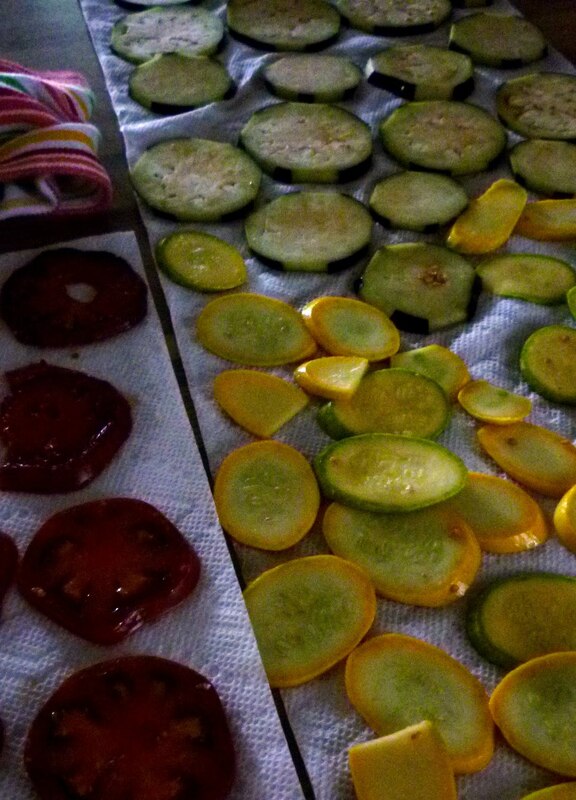 I don't know why it never occurred to me to do the same thing with the eggplant and zucchini that I was doing with the tomatoes. I even use this technique in a summer squash gratin that I posted several years ago. It must have been something about the juxtaposition of the two classes, combined with my current reading material (Salt, Fat, Acid, Heat by Samin Nosrat—I was reading the section on the properties of salt at the time), that dropped the idea into my head. So a few days before I taught my Provençal Vegetable Galette, I made it for my own table...this time salting and blotting the vegetables instead of roasting them. 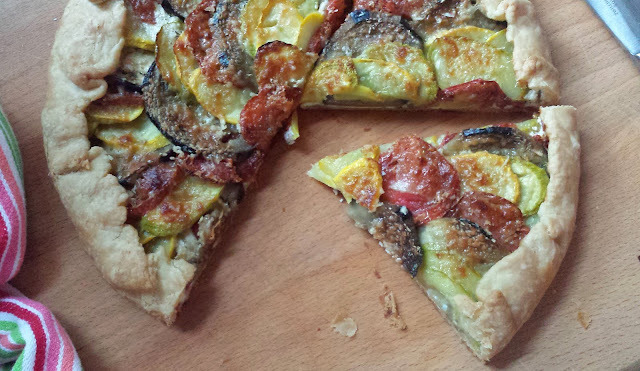 Not only was the resulting tart satisfactorily juicy, the crust wasn't at all soggy. As a bonus, the tart was beautiful—much more so than in its previous incarnation. 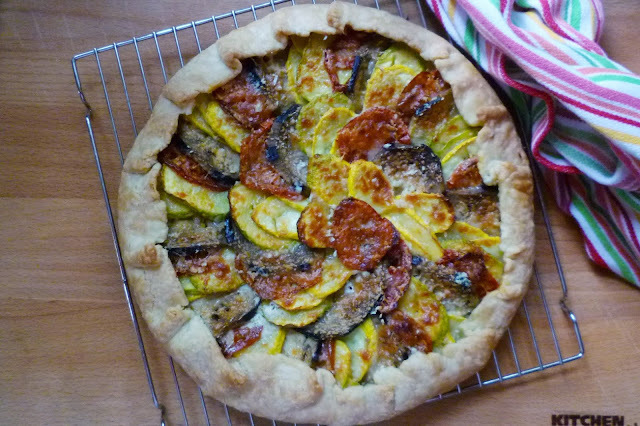 I should add that both versions of the tart feature a smear of herbed cheese underneath the vegetables. This layer of cheese acts as a barrier to the juices being released by the vegetables as the tart bakes (whether the vegetables go into the tart cooked or uncooked). 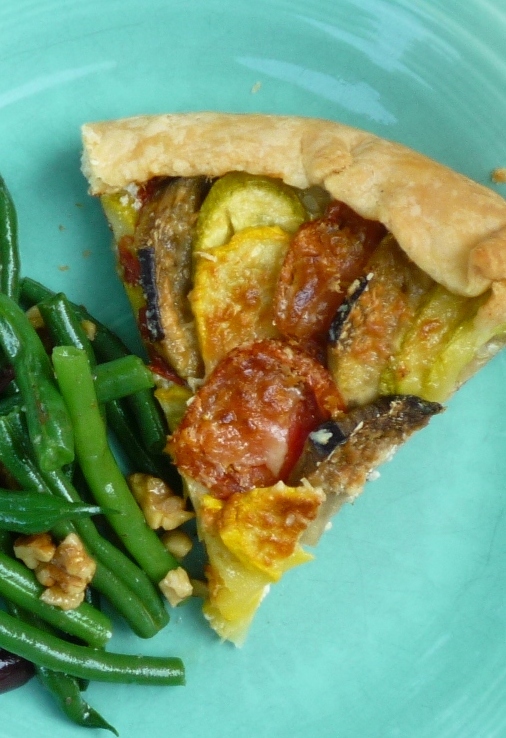 The tart could probably be made with cooked vegetables without the layer of cheese. 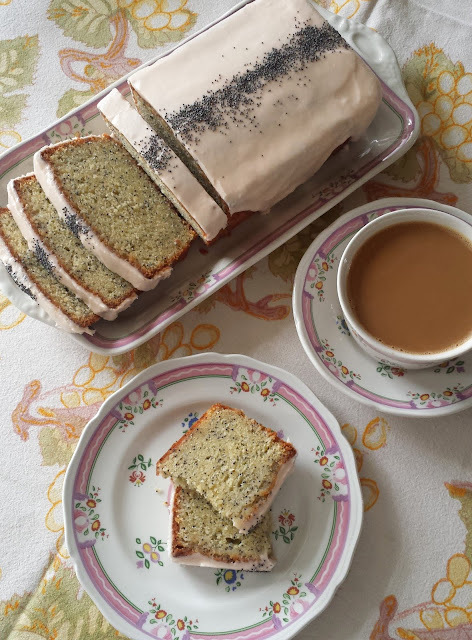 But it could not be made with the uncooked vegetables without it (or some other "barrier"—a layer of cooked onions or leeks, for example). The origin of this tart is a recipe in Maria Helm Sinskey's book The Vineyard Kitchen. She recommends using Japanese eggplant and plum tomatoes. 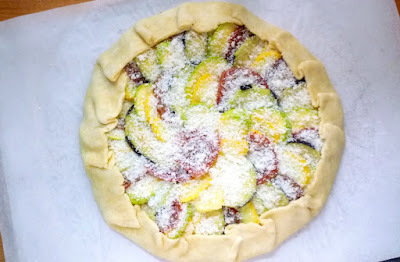 This makes it so that the eggplant, zucchini and tomatoes will all have a similar diameter and can be arranged in beautiful, even, concentric circles. I have found that ordinary globe eggplant and vine-ripened tomatoes work fine—and can be beautiful as long as they are thoughtfully arranged. One of the things I love the most about cooking is that I'm constantly learning more.... Learning about technique...learning about the properties and characteristics of specific ingredients...learning how to apply my battery of techniques to an ingredient or set of ingredients in order to produce a desired result. And when I cook thoughtfully, I learn something almost every time I step into the kitchen. The tart was good before (I don't think anyone but me ever had a problem with it!). It is even better now. Line a baking sheet with parchment paper; set aside. Roll out the dough on a lightly floured surface into a circle that is about 1/8-inch thick and is about 12 to 13 inches across. Trim any especially uneven or ragged edges—but don't worry too much about it, this is supposed to be a rustic tart. Brush off the excess flour. Transfer the dough to the prepared sheet. Cover loosely with plastic wrap and chill for at least 30 minutes. Wash and trim the eggplant and zucchini. Wash and core the tomatoes. If the eggplant skin seems tough, "stripe" the eggplant by using a peeler to remove lengthwise strips of skin, creating a striped effect. Slice the eggplant into thin rounds (slightly less than 1/4-inch thick). Slice the squash to a similar thickness on a slight diagonal. Transfer to a bowl and toss with 3/4 t. kosher salt. Slice the tomatoes a scant 1/4-inch thick (use a serrated knife) and spread out on a double thickness of paper towel. Sprinkle the tomatoes evenly with salt. Let the eggplant, squash, and tomatoes sit for 10 to 15 minutes so they can give up some of their liquid. While the vegetables release some of their liquid, place the ricotta in a small bowl with the olive oil, flour, herbs and garlic. Mix until well blended. Season to taste with salt and pepper. When you are ready to build the tart, lift the eggplant and squash out of the bowl, leaving as much liquid behind as possible. Spread the vegetables out on paper towels. 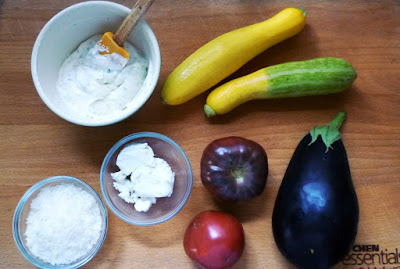 Blot the eggplant, squash and tomatoes with paper towels to absorb the excess liquid. Taste a piece of squash and/or a tomato and add more salt if necessary. Spread the ricotta in a 9-inch diameter circle in the center of the chilled pâte brisée (leaving a 1 1/2- to 2-inch border of dough). Shingle the vegetables attractively over the cheese, distributing the different vegetables evenly and arranging in concentric circles. Brush the vegetables with olive oil. Scatter the pecorino evenly over all. Gently fold the edges of the crust up and over the filling to form a rustic edge. Pleat the dough as necessary, pressing lightly into place. 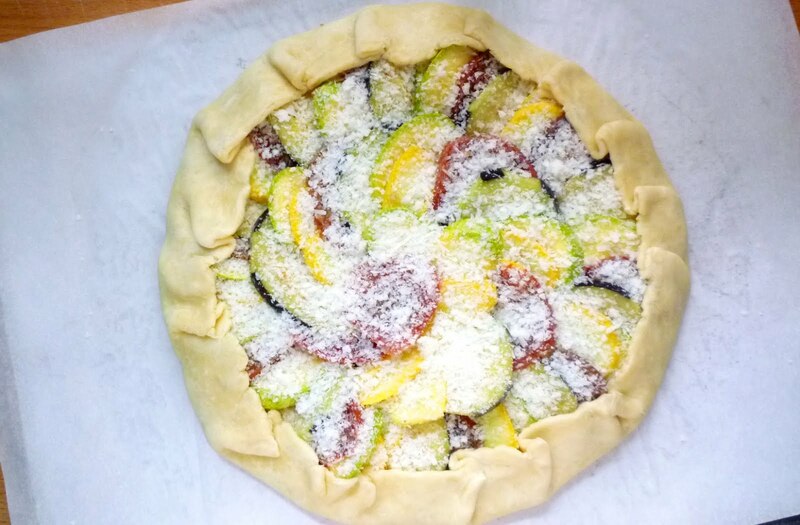 Bake the tart in a 400° oven on the lowest rack or on a preheated baking stone set in the middle of the oven until the vegetables are bubbling, the pecorino is golden and the crust is crisp and golden brown—about 40 to 50 minutes. Transfer the tart to a wire rack. Let the tart rest for 5 minutes (or cool until just tepid) before serving. Tart serves 6.